After saying I would follow up on this guest post on Kristen’s blog, I should probably be writing something more about all the things (and trust me there are lots of scrappy little things growing in many nooks and crannies around my place right now). ie, Every time I finish another Caesar Salad, I plunk a romaine end in the tray of water with all its friends. I’ve not gotten around to putting any in soil, yet, but I’m sure it might happen. I might wait and put them in a pot on the roof instead though. I’ve also been working in wire and other scraps … other botanical things that have been taking up a LOT of my time. I just tweeted about this new endeavour … crafting a collection of chiffon pop-on poppies! SPRING AHEAD – I’m working on other precious metal projects, too, and learning how to use miniature power tools that I recently wrote about here. Anyone else got Spring Fever? There’s a new Citrus Challenge going on again and it appears to be an ‘anything citrus’ goes so that opens it up. I’ll toss my 2nd ferment lemon ginger kombucha into the ring before the end of the month if someone takes me up on this and provides a guest post before the end of January. Submit your post to brenda@gardenbre.com so I can add it to my blog. And here’s where you can submit your entry if you want to officially join the Food In Jars community and continue with their monthly challenges … and post on your own blog. I only got as a far as the citrus challenge in January of 2017 but I am about to take up the challenge again for 2019 – if I get any takers this month. UPDATE: I took a look at jenny veleke’s salt recipe and added grated organic lemon peel using the Salamoia Bolognese recipe I started making years ago from Gayla’s recipe on You Grow Girl. It’s running a close 2nd as my favourite seasoning. I added my own touch to this marriage of both recipes and grated freshly ground black pepper into the mix. This is an old post from my gardenbre days … written in my 4th year of gardening at the allotment. I’m beginning my 10th year now! Wow. How. Time. Flies. Two pots on the stove. A reminiscence AND a segue from my prior post below. In the small pot at the back are yellow and green tomatoes from my last garden haul, chopped & simmering, providing a nice colour change to the red pastes and it tastes quite fresh. It supposedly has a lower acid content than the red which is good for anyone with dietary issues … like my mother. In the big pot at the front is a zucchini marmalade. 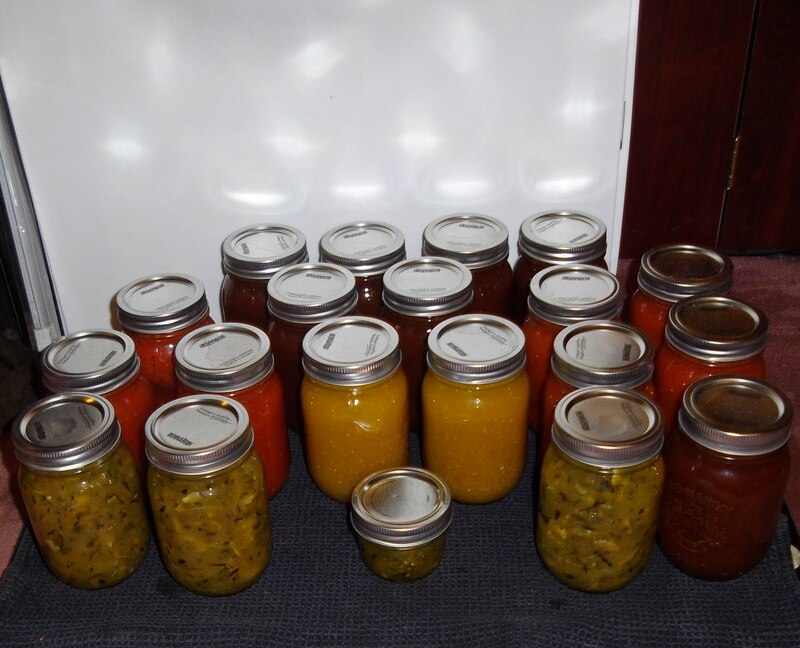 I slightly altered a recipe I used from the cosmic cowgirl who said she got it from the BerNARdin Guide to Home Preserving magazine which I bought at Canadian Tire along with most of my canning gear (the cosmic cowgirl’s post doesn’t exist now so I’ve linked to this recipe). 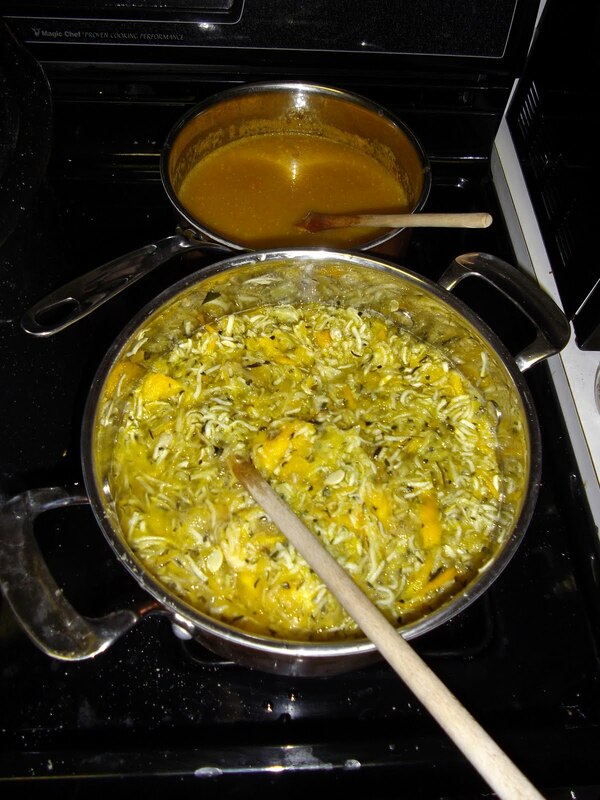 Instead of using fresh ginger and putting it into a cheesecloth bag with the pith, I sliced candied ginger in syrup and added it directly into the zucs, oranges, lemons and sugar. Even after hours on a slow boil, it only gelled to a little beyond a syrup but enough that it was spreadable and not pourable – there was little liquid left … just enough that I was able to spoon it over the top of the slaw to cover it. I will use it as a condiment with cheese and foie gras. 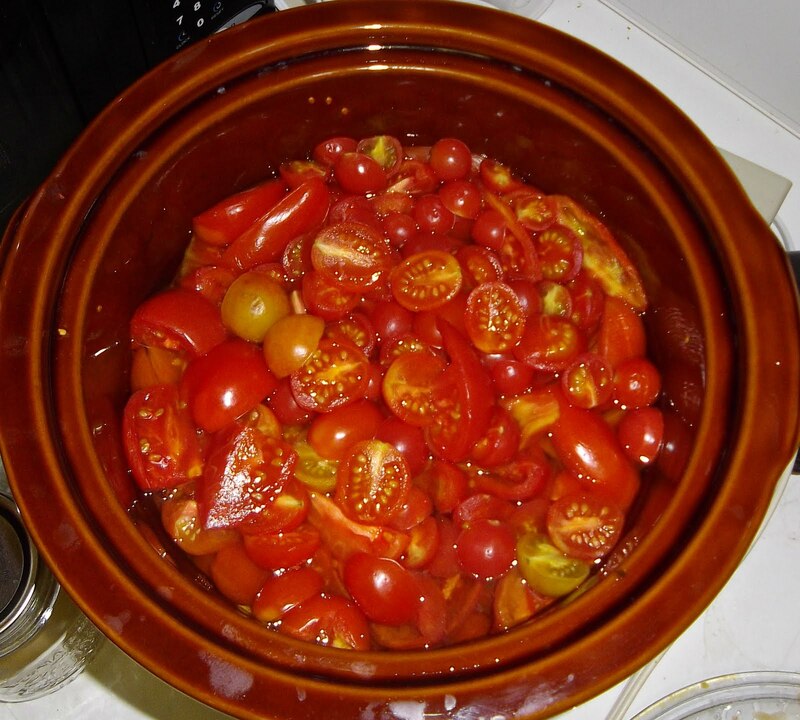 At back are jars of dark tomato sauce that was in the slow cooker on high for 3 days total (I would only have it on high for 2 days if I did it again – I think) or maybe on low for 3 days). That said, I still need to taste it on pasta to see if the flavour is too deep. It’s a work in progress. I will dilute it with the other sauce if necessary. I like the colour and think the layers of flavour will prove to be good so it was worth the experiment. For this batch of San Marzano tomatoes, I made a simple syrup using organic golden cane and threw in a dash of pink salt harvested in the Andes Mountains. The salt gives it a bit of caramel taste. 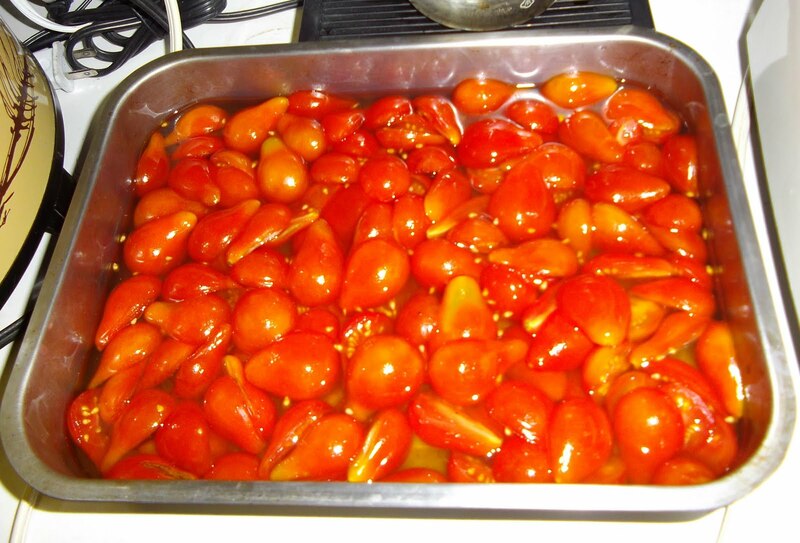 I poured the boiling syrup over the tomatoes and let them stew for over an hour then placed them in the dehydrator on high for a few hours with thick cut zuc chips dipped in syrup as well (eaten – so not shown)! 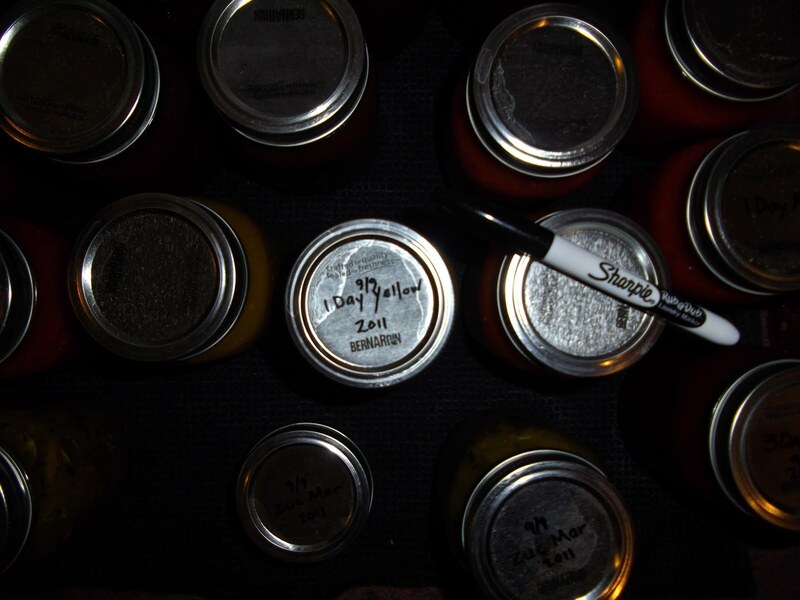 I have finally figured out a system for labeling – writing directly on the lids with a laundry ‘sharpie’ works well with the metal lids because they can only be used to seal the jars once (I’m not sure yet how I’ll label my Tattie Lids which are reusable – I have to find a label that stays on yet is easy to remove once it’s done it’s job – the ones I got a year ago from Lee Valley already look like they’ve lost stickiness. All in all – yesterday’s annual first day of water bath canning went well. There are dirty dishes galore piled on the floor waiting for some soap and water … and the kitchen, dining and living rooms look like a pack of wild animals were let loose to party in them … other than that … smooth as dupioni silk! Note to Self – get a gel mat for the kitchen sink/stove area. Woah was Me & my aching back! This was my first time making it and I’m quite happy with the results. My absolute favourite is the Bon Maman Whole Slice Orange Marmalade which I first discovered in Paris … later I found some at the Atwater Market in Montreal, Quebec. There were no recipes I could find using whole orange slices so I’ve patched together a few recipes . Then I sliced them about 1/4″ thick and found that about 2 and a quarter cups of water was enough to cover them in the pot I used. then add the same amount of organic sugar as water (be sure to measure that H2O)! and boil it all for as long as it takes … to pass the wrinkle test. My batch took 1 hour and 45 minutes exactly until the surface of my last sample wrinkled … see Note on Setting Point by Christopher Robbins (no not that one – different spelling Pooh). What you need to know is at about 10 minutes in, I took the best orange slices out … I did this to stiffen them up so they could be standup bits for the sides of the jar while I poured the jam rather than having it all be one floppy-ploppy marmalade mess. Leave it to Rachel Koo, one of my favourite chefs, to not only have a video using dehydrated orange slices because I’m using this part from her Orange Marmalade Tartlets recipe; but also she’s got one masterfully layered recipe using these and slices of fresh citrus and marmalade for tartlets – garnished with double cream and yogourt. And yes, Rachel pulled her slices out after 5 minutes, but because I wanted to make sure they were really sweet, I gave mine twice as long in the boiling sugar water before placing them on parchment paper and into my toaster oven for about half an hour at about 200°F. I turned them over twice (and I know Rachel used a silpat baking mat and she didn’t flip hers but I was pretty sure they would surface dry faster if I did). When I took the best orange slices out, I realized I didn’t have a whole lot left in the pot of boiling sugar water so I thinly cut and peeled 2 lemons I had on hand to toss into the mix. So here we are – ta da! Since taking this photo, I topped the jar up with more syrup and it’s produced a nice layer of gel on top … sweet! This is the most fun I’ve had since the holidays … plus all the running back and forth to the stove every 5 minutes doing patch taste tests (and no Mr. Robbins didn’t suggest taste tests to go with the wrinkle tests … but heck I do)! and so I powdered up some of the organic sugar and covered some of the remaining slices to use someday as garnish on that tartlet of Rachel’s. One of my favourite ways to use citrus marmalade is in a crepe suzettes flambe´. In this video, where the chef uses raspberry puree, I’d use one of the sliced oranges as a garnish on top rather than as a base. I also think rather than straight up whipped cream, I’d use Rachel’s double cream and yogourt combo, if anything … it really does stand on it’s own. Stay tuned for that recipe! And last but not least, Food in Jars has an amazing post on Trouble Shooting your Marmalade Making should things go sideways!